What did you shoot this (long) weekend? 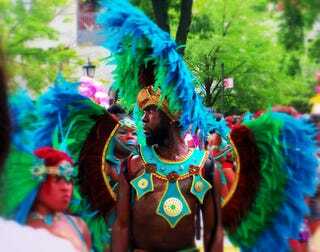 My wife and I headed out to the West Indian Day Parade (since the streets were shut down from Sunday night and I couldn't drive anywhere, why not) and I managed to get a few shots. Taken with a Pentax Q7 and kit lens, edited in Snapseed on my iPad shortly after taking it.